How can I attach a screenshot picture? Click the More Reply Options button in the lower right hand corner. Browse to the file on your computer > click the Attach This File button > the post your reply. Funny thing, these windows didn't load this time on boot up but they usually do. Can you say why you didn't point out the lack of free HDD space being the main problem after first OTL log? I Don't mean to sound rude, I'm grateful so far. Should I run SFC and post results or wait until I've freed up space to defrag and post both results together? Estimated portable drive arrival Monday. So to confirm, the Virgin Mobile pop-ups have ceased? Can you say why you didn't point out the lack of free HDD space being the main problem after first OTL log? Just an oversight on my part. I was looking for a malware issue, not a hardware issue. But none the less I should have noticed that on the first log. Should I run SFC and post results or wait until I've freed up space to defrag and post both results together? I would wait until after you have freed up the hard drive space to run both. Run the defrag first, reboot, then the SFC. I'll keep the thread open until next week, just post back after you get things situated and are able to run the scan. No they are still loading on boot up. 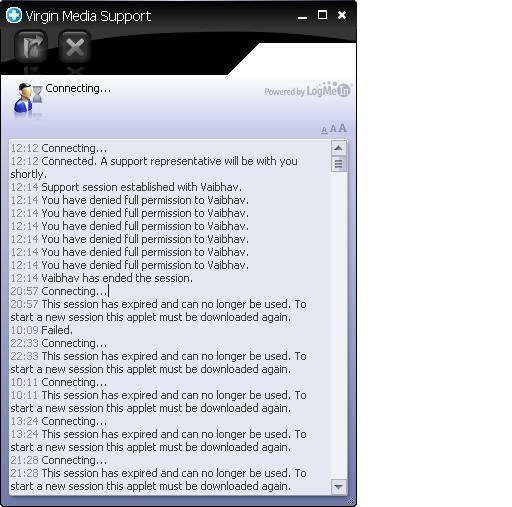 They started popping up when we went through virgin broadband tech support and virgin had access to my PC. Now they load most times ( and I can hear them loading ) and I can't shut them straight away as they keep trying to load. It's a dayam pain in the arse. Edited by cousinkevin, 07 November 2013 - 01:22 PM. It appears from the screenshot you posted the program used to access your computer was LogMeIn. So let's remove all entries from your log and see if that clears up the pop-ups. You can run this now, you don't need to wait for the new hard drive. How's the computer running any pop-ups? Well I ran OTL and clicked run fix after pasting in the bottom box but it's not responding and now stuck. What should I do now, there is no start button or anything on desktop other than OTL? Lucky I'm using my Mother's laptop to post this message. If I don't get a response from you before I go to bed I will switch it off at the tower and try again in safe mode. Do I uncheck LOP and Purity before I click run fix? Ran in safe mode, same result. I can see the LogMeIn Applet folder with 12 .tmp folders inside. shall I just delete them? BTW, is an applet a mini application? Edited by cousinkevin, 08 November 2013 - 05:42 PM. I changed the script a little, please try this. Don't worry about LOP or Purity. Yet again another change to the script. No pop ups on boot-up. No AVG icon in system tray until I click desktop icon. Sounds like something is trying to load. C:\Documents and Settings\Lynda\Local Settings\Application Data\LogMeIn Rescue Applet\LMIR000C.tmp folder moved successfully. C:\Documents and Settings\Lynda\Local Settings\Application Data\LogMeIn Rescue Applet\LMIR000B.tmp folder moved successfully. C:\Documents and Settings\Lynda\Local Settings\Application Data\LogMeIn Rescue Applet\LMIR000A.tmp folder moved successfully. C:\Documents and Settings\Lynda\Local Settings\Application Data\LogMeIn Rescue Applet\LMIR0009.tmp folder moved successfully. C:\Documents and Settings\Lynda\Local Settings\Application Data\LogMeIn Rescue Applet\LMIR0008.tmp folder moved successfully. C:\Documents and Settings\Lynda\Local Settings\Application Data\LogMeIn Rescue Applet\LMIR0007.tmp folder moved successfully. C:\Documents and Settings\Lynda\Local Settings\Application Data\LogMeIn Rescue Applet\LMIR0006.tmp folder moved successfully. C:\Documents and Settings\Lynda\Local Settings\Application Data\LogMeIn Rescue Applet\LMIR0005.tmp folder moved successfully. C:\Documents and Settings\Lynda\Local Settings\Application Data\LogMeIn Rescue Applet\LMIR0004.tmp\diag folder moved successfully. C:\Documents and Settings\Lynda\Local Settings\Application Data\LogMeIn Rescue Applet\LMIR0004.tmp folder moved successfully. C:\Documents and Settings\Lynda\Local Settings\Application Data\LogMeIn Rescue Applet\LMIR0003.tmp\diag folder moved successfully. C:\Documents and Settings\Lynda\Local Settings\Application Data\LogMeIn Rescue Applet\LMIR0003.tmp folder moved successfully. C:\Documents and Settings\Lynda\Local Settings\Application Data\LogMeIn Rescue Applet\LMIR0002.tmp\diag folder moved successfully. C:\Documents and Settings\Lynda\Local Settings\Application Data\LogMeIn Rescue Applet\LMIR0002.tmp folder moved successfully. C:\Documents and Settings\Lynda\Local Settings\Application Data\LogMeIn Rescue Applet\LMIR0001.tmp folder moved successfully. C:\Documents and Settings\Lynda\Local Settings\Application Data\LogMeIn Rescue Applet folder moved successfully. Edited by cousinkevin, 10 November 2013 - 04:11 PM. The computer will remain slow until you have been able to free up some hard drive space and successfully run the defrag step. This sounds like a setting with AVG. I don't use AVG but these directions should get you close enough to find the setting you are looking for. Open the user interface of AVG. Click Tools, and then Advanced Settings. At the appearance part of the tree on the left, there are a bunch of Display System Tray options at the bottom. It sounds like a brief grinding sound twice. Got my portable drive to move some stuff, but how can I copy folders/files to DVD as a backup? Otherwise I'll have some files in one location only. Is it coming from your cooling fan, or does it sound more internal?